Last spring, I spent a couple of weeks traveling alongside a group of friends. We spent most of our time together in the car, our conversation winding at an easy, tender pace, eventually landing on the topic of what school lunch was like in our high schools. We took turns describing the layout of our cafeterias, the kinds of foods available, and whether or not we bought lunch at school or packed. My stomach flip-flopped when it was my turn to speak. I felt my pulse quicken. I was frozen, but surrounded by people I trusted and admired I felt like I could be honest. Somehow I coughed up the words, “I didn’t eat school lunch at all because I struggled with an eating disorder.” The car was quiet for a moment and I filled with regret. And then, instead of opposition or misunderstanding, two others volunteered stories from their own disordered journeys with food. For me, restricting began as a simple way to cope with anxiety I struggled with on a daily basis, but it eventually turned into a full-blown obsession. Food consumed me. It was all I could think about, yet I was barely eating any at all. I viewed food only for its caloric value, as a toxic thing, and depriving myself of it soothed and comforted me. I also felt some kind of misguided pride in my ability to control it all. The calories I consumed, slowly moving the number on the scale lower and lower, and maintaining the pretense that there wasn’t a problem at all – anorexia was a way to bring a sense of order to the things that felt chaotic in my life. I was so tightly wound around the idea that if I could just control this one thing – food – then I’d be the kind of person I wanted to be. Yet despite feeling like I was in the driver’s seat, my illness had spiraled into something I could no longer control. I was completely and utterly disconnected from myself, from my body, and from others. I’ve been thinking about how to share this story for years. I spend a lot of time around people who are constantly talking about what's influenced their relationships with food, but anytime it's been my turn to share, I’ve skipped ahead from the messy, disordered parts and delivered a well-rehearsed speech about the stuff I’ve assumed people wanted to hear – the farmers markets, the community organizing, the passion for cooking. It wasn’t for the sake of privacy, but because I felt ashamed and embarrassed by how much I’d struggled to love myself and to have a normal, healthy relationship with food. I felt like stories about anorexia weren’t relevant when there are people all across the country who don’t have the opportunity to eat healthy food at all. When there are things like childhood obesity, food insecurity, the unfair treatment of farmworkers, and so many other problems with our food system at stake, why should my story of disordered eating have a place at the table? But overcoming and understanding my eating disorder, and finding love and joy and passion for food, has inspired my career, shaped my values, and pushed me to find balance in all parts of my life. For so long, I've been running from this experience, but maybe I actually need to be running towards it. Instead of tucking it away in a neat little box in my life's attic, maybe I need to unpack it, and set it out on the table. Early in college, during some of my most vulnerable moments, I used to wander through the market. I felt really lost at first; I had no idea what to do with the majority of the vegetables I saw, but felt a surge of energy just walking through the aisles. It’s hard to let sadness win at a farmers market – buying your food directly from the hands of the person who grew it is the exact opposite of anorexia. It’s connection. It’s purpose. And I found it freeing and empowering. 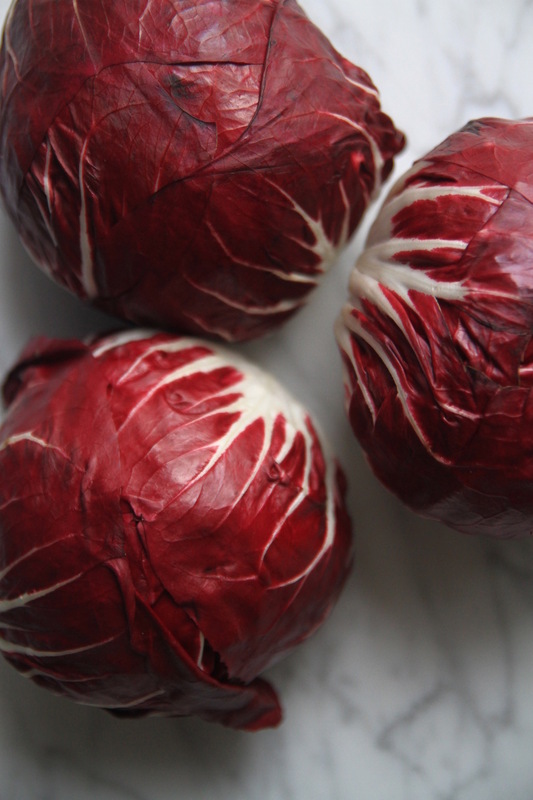 Farmers were readily willing to offer me advice about how to cook what was on their tables, so I bought vegetables I’d never seen before and just experimented in the kitchen, free of recipes or restrictions. I felt like I had unleashed a creative side of myself that I hadn’t ever known. Like a new perspective had been shaken loose. Very quickly, cooking became a creative outlet for me and the market was an endless source of inspiration. I found myself waking up with the sun to beat the crowds and score the first strawberries of the season. I started spending weekends canning 40 pounds of tomatoes, just so I could savor their flavor a little longer. And I found that the closer I got to my food, the more easily I was able to see it as something that nourished both my body and my mind. I also tried my hand at growing my own food. I bought tomato seedlings and planted them in big five-gallon buckets that I lined across my back porch. The smell of their vines stuck to my hands and churned up memories of the summer my parents grew them in the raised bed in our backyard. I planted lettuce and radishes and herb seeds in a long wooden planter and watched their tiny sprouts shoot out of the soil. My little garden helped me remember that I, too, need lots of water, food, sunlight and love to be a happy, healthy person. When I pulled a radish out of the dirt for the first time, I felt with stunning clarity that food had something to teach me, and I was finally ready to listen. Over the years, I've also worked hard to overcome the feelings of guilt and shame I’d grown to associate with food, and have tried to apply the same mindfulness that I discovered through cooking and gardening to my attitude. It hasn't been easy. It has taken many years and many baby steps to reframe my vision of a healthy, balanced life. And truthfully, I am still working on this every single day. I gave my eating disorder so much room in my head to thrive on my vulnerabilities. There have been days where it felt nearly impossible to pull myself out of a spiral of self deprecation, days where I felt like crying because, God forbid, I ate a bowl of ice cream without guilt. But there came a point where I felt so exhausted with secretly living in the shadows of my self-consciousness and inadequacies. It didn’t happen like the flip of a switch – you don't just wake up one day and think, "great, things are gonna be different from now on". It took one day at a time and a whole lot of intention. Because that's what recovery is. Recovery is not a destination. Recovery is looking yourself in the mirror every day and saying, "you are not allowed to think anything negative about your body, your weight, or your looks anymore. If you think any of those things, push them out of your mind". And I have tried so, so hard to do this. It doesn't mean I'm always successful and I always feel great about myself, but it means I've decided not to give those negative feelings any more of my energy. When I started digging deeper into why and how I’d turned so far against myself, I realized that I was depriving myself of nourishment and pleasure, all in the name of striving towards a level of perfection that, it turns out, doesn't even exist. It became increasingly clear that as soon as I stopped trying to obey a set of self-imposed rules, I felt better. The more I was able to understand myself and stop masking my emotions in a layer of perfectionism, the easier it became to step off the tightrope. The more room I gave myself to experiment in the kitchen and build relationships with a community of radical women, inspiring farmers and food advocates, the more connected I felt to myself, my body, and the world. And so my point of sharing all of this now is: I’ve been silencing the part of my story that’s given me strength and purpose because it feels scary to talk about it. And that's not something I feel okay with. I am not okay with the thought of someone dropping by this blog and thinking my relationship with food has always been farmers markets and perfectly-styled bowls of soup on marble tables. We are all searching for connection and authenticity, and what we believe will repel people might actually do the exact opposite. We all have the right to tell the truth about our lives, and I've known for a while now that it’s important to me to start owning my narrative. It’s also not just about my story – I haven't met a woman who doesn't struggle with feeling okay about her body and her beauty and her size and all of that. Whether those feelings have escalated into a full-blown eating disorder, a reverence for thinness and an obsession with correcting our physical inadequacies is a part of our country’s food culture, and I very much want to change that. Changing my own relationship with food ultimately boiled down to relearning to love myself and rekindling my connection with people and the earth. And spending time in the kitchen and in the garden helped me remember that food is so much more than its caloric value – food is joy, and power, and it is a teacher that will always be with me. Eating disorders aren't uncommon at all, but talking about them still is. But we can’t change this part of our food culture, unless we’re courageous enough to speak up. It might be a life long struggle, but I'm going to do my best to speak my truths, in the face of so much pressure to be otherwise. We're right in the middle of what I hope is New York's last heat wave of the summer, but nevertheless, it's roasting season. I've been on a crazy baba ghanoush kick – partly because I don't have a lot of other eggplant tricks up my sleeve, and we've gotten so much eggplant in our CSA over the past few weeks. But also because it's delicious, it's the perfect picnic or potluck food, and having to withstand a little extra heat in your kitchen during an already too hot season is literally the hardest part of this recipe. I've been eating it for dinner on weeknights with cucumbers or crusty bread, and bringing it to work with a side of chick peas, feta, tomatoes and pita for a hearty lunch. 1. Slice the eggplant and place on a baking sheet. Drizzle the eggplant with olive oil while the oven heats to 400 degrees. Roast for 20 minutes, or until super soft and smoky. 2. Add all of the other ingredients, except for the sesame seeds, to a food processor. Once the eggplant is cool enough to handle, transfer it to the food processor. Mix until you've reached a smooth and creamy consistency, adding a bit more olive oil or lemon juice as needed. 3. Scoop the mixture into a serving bowl. Drizzle olive oil and sprinkle sesame seeds on top. Serve with pita, crusty bread, or cucumbers. Plucking a little, golden cherry tomato directly from the vine, or straight off of a market table after it's been sitting in the sun, is a pleasure I look forward to for months. It's not just about taste, either. I love the whole new excited energy that fills the air when the first tomatoes show up at market. People are buzzing around a little more quickly, buying one too many quarts, and eating them by the handful in line before they've even had a chance to pay. They're like some kind of magnetic, magical force that's impossible to resist. By mid summer, the anxiety calms, but tomatoes are no less popular. They start to show up on every dinner table, in every restaurant with the usual suspects, and I do my best to eat my fair share – tossed back whole, or halved and tossed with mozz and balsamic, or blistered under the broiler then scooped over fresh beans, or as a fresh sauce, or in a panzanella, like the recipe that follows. Regardless, each year I fall into the same panic that they'll be gone before I've really had a chance to enjoy them, and so I turn to canning, a preserving process that any cook who's as moved by tomato season as I am can likely find a great deal of satisfaction in. I learned to can by necessity. Right after college, I started managing a farmers market in Kentucky. Every Tuesday, Thursday, Saturday and Sunday, April through November, I'd wake up before the sun and drive from my home to the market office to pack supplies into the giant bread truck we'd transformed into our market van. Once it was fully packed, I'd head downtown, arriving in an empty park, right before most of the farmers. One by one, they'd each arrive, and we'd all spend hours pulling tables, tents, signage, and produce out of trucks and into formation on the sidewalk, until the entire space had been transformed into a vibrant marketplace – all before 7am. Until 3pm, customers came and went, farmers sold food and shared tips and tricks for how to prepare it, musicians set up and played their tunes, and chefs whipped up simple recipes and shared samples on site. I manned the visitors table, showed customers around, and made my rounds between farm stands to collect daily attendance fees and catch up. Farmers are a generous bunch, so what wasn't bought by customers or sold to local restaurants was often donated, to food banks and to me. I'd go home each week with dozens of pounds of some of the freshest food in the state, along with suggestions for what to do with it from farmers and chefs alike. This is where I first learned of panzanella, a salad made of chunks of stale bread and the freshest, juiciest tomatoes, dressed in olive oil and vinegar. After sampling it at the market for the first time, I loaded up on tomatoes and ate it for a week straight. And for the tomatoes I couldn't use up in panzanella, I learned to preserve. 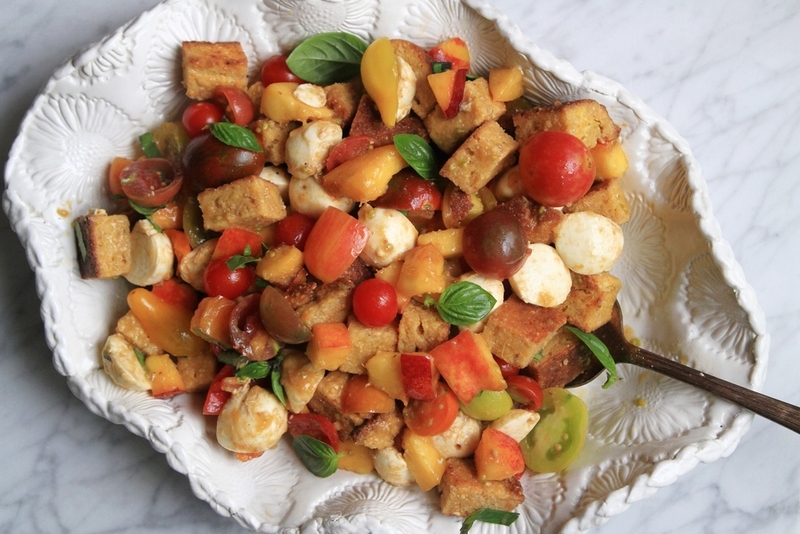 I hadn't made a panzanella, let alone with cornbread, for years, until I was reminded of it by this recipe on Food52. It felt immediately right; panzanella always reminds me of that first summer at the market, and cornbread never fails to bring me right back to Kentucky (specifically, right back to the porch at Billy's BBQ). I added nectarines because they're a delicious and juicy partner to tomatoes, and with a bread as dense as cornbread, extra juice doesn't hurt this dish. The rest of the ingredients you likely already know by heart: basil, mozzarella, balsamic vinegar and olive oil. They all come together in a rich and deeply reassuring way. The buttery cornbread bolsters the sweetness of the nectarines and tomatoes and rounds off their acidity, while the mozzarella adds a subtle backdrop. For those of you interested in learning to preserve tomatoes, which I wholeheartedly recommend, I suggest consulting experts, like the blogger behind Food in Jars or the Ball Canning Guide, and not deviating too far from their recipes. Canning is a wonderful way to enjoy fresh tomatoes all winter long, and it's pretty unlikely that a canning project can go wrong, so long as you follow tried and true recipes. Panzanella recipe adapted from Food52. Cornbread recipe barely adapted from Mark Bittman. 2. While the cornbread is baking, make the salad: Add tomatoes, nectarines, basil, mozzarella, olive oil, balsamic, and sea salt to a large mixing bowl. Toss until combined, then let sit for 10-15 minutes to let the fruit get juicy. 3. 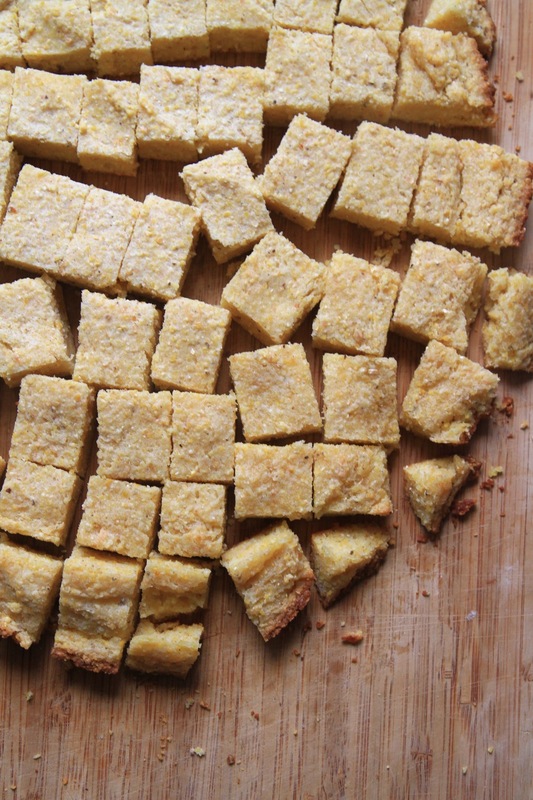 Once they've cooled, add the cornbread croutons to the mixing bowl. Toss until combined, then let the whole thing sit for another 10-15 minutes, so the cornbread can soak up the juices. Here we are again: it's mid-August, and the New York City heat is unrelenting, as if the thermometer outside is permanently stuck at "hot and sticky". A few days ago it rained, but the temperature didn't drop a bit. We're promised an afternoon rainstorm and I'm feeling hopeful, but for now, I'm parked inside with our rickety air conditioner on full blast. Growing up, I was never a huge fan of summer. I know, it's an unpopular sentiment, but in the midwest and the south, the humidity was unbearable, like some kind of sustained misery, and each year I found myself counting down the days until the seasons changed and we'd get a much needed break from the swampy, thick, airless heat. Simple things, like walking from the front door to the mailbox, became something to dread. And as a kid whose skin burned easily, the hot summer sun felt especially oppressive, like it was something I had to hide from. In New York, while I didn't expect the summers to be so scorching, the same has held true. I still feel the same sense of paranoia on the sunniest days (if you're a pale kid like me and have ever had a burn so bad your skin has blistered, surely you can commiserate), and I'm still not-so-patiently waiting until we can spend the days outside without breaking a sweat, and survive in this city without a big box of air conditioning pumping through our tiny apartment. But on the plus side: the produce. If there's anything to be thankful for during these days, it's the plentiful bounty that comes as a direct result of warmer weather. No other season makes eating well this easy. Meals in the summer feel less fussy, and when it's so hot that you can't bare to turn on the stove, dinner tends to look a bit more like assembly and less like cooking. 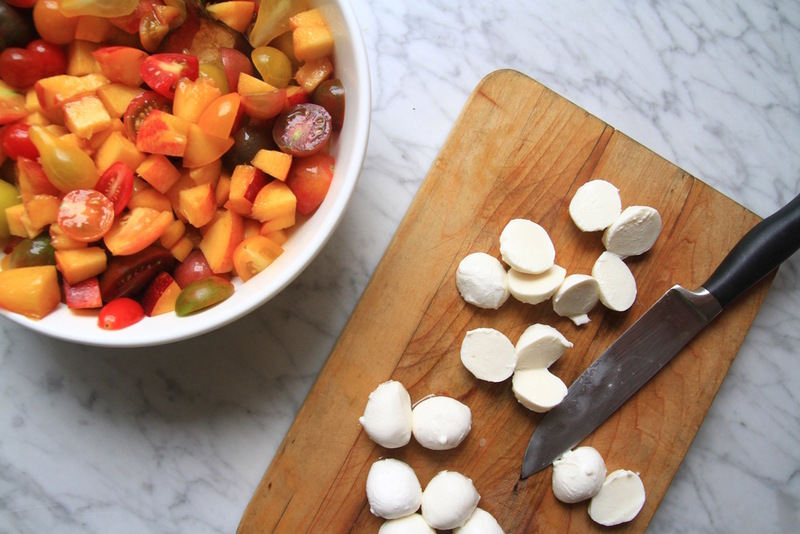 Cherry tomatoes, sliced in half, and tossed in a bowl with mozz, basil, olive oil and crusty bread. A batch of quick-cooking quinoa, topped with whatever vegetables and herbs I have on hand. A medley of lettuces and greens, tossed in a simple garlicky-lemon dressing. These are the moments where I find myself saying a few words that rarely make it out of my mouth, "I love summer". Which brings me to this slaw, inspired by the corn slaw recipe in Ottolenghi's book Plenty More, and a salad (or "slawlad", as Grayson and I have been calling it) that I've been making variations of since the moment sweet corn entered the scene in early July. To say I adore Plenty More is an understatement. It's truly a manifest of love for vegetables; its pages brimming with colorful, thoughtfully placed photos, all fighting for my attention. I've dogeared so many pages at this point that the place holding system's become irrelevant: I want to make every single recipe in this book. And when the weather is this hot – the kind of weather that essentially screams for a surge of thirst-quenching greens and crunchy vegetables – Ottolenghi's slaw as it's written, or in the variation you'll see below, is like a tall, hearty, drink of water. All I can say is, this ain't your grandma's colorless slaw that you might have scooped onto your plate, and then promptly avoided with your fork, at a family potluck. This slaw has no place next to a bowl of saucy baked beans, but rather is the star of the show. It's refreshingly cool, a little crisp and crunchy, then creamy with a little bite. Take the quinoa or leave it – I liked the heartiness that it added, which made it feel like a complete meal, rather than a side dish. 1. Quick-pickle the cabbage, carrots and onions: Place the vinegar and water in a small saucepan with a teaspoon of salt. Bring to a boil until the salt is dissolved, then remove from the heat. Place the cabbage and carrots in a large mixing bowl, and the onions in a small bowl. Pour two-thirds of the vinegar liquid over the cabbage and carrots, and the remaining liquid over the onions. Toss until coated, then let sit for 20 minutes. Strain and rinse the vegetables and pat them dry, then place together in the large mixing bowl. 3. Make the dressing: Place mayonnaise, mustard, olive oil, lemon and garlic in a small bowl and whisk until combined. 4. Mix it all together: Add the remaining vegetables, quinoa and herbs to the large bowl and toss, until thoroughly mixed. Pour the dressing over the slaw, a little at a time, and continue to toss, until completely coated. With all of the heartbreak that's happening in the world right now, it almost feels wrong to sit here and write a blog post about sugar berries. I feel sick, outraged, horrified and devastated. I feel unsure of what my role in justice should be, yet responsible and desperate to do something, anything. We live in the midst of wildly atrocious events, and I know a lot of people are hurting. I'm trying to make sense of it all and I'm trying to listen. I'm trying to learn how to do more than just name my privilege – trying to understand how to use it to propel the voices of those who are least valued and most hurt by the system forward. I'm trying to move past my inclination to retreat into silence, and speak up, even though my words might be imperfect. The kitchen always offers solace and room for contemplation. As I sit here in the comfort of my own home, a bowl of berries on my lap, feeling entirely helpless, I can only do what I know: demand radical, structural changes; refuse to feel numb to the violence; and use food as a tool to comfort, love, connect and heal. Food breaks down barriers and grounds us. Food is learning, sharing and understanding. This recipe is not groundbreaking, or any kind of metaphor for how complicated the world feels, and is in no way an answer to the injustices that need to be addressed. It's simple, because that's the kind of food I turn to for comfort. Less than a week ago – before the world fell even more apart – I ruined a pie crust. I had big plans for this crust, but with the oven cranked up high on an already sweltering day, plus a heavy dose of impatience, it quickly softened, stuck to the counter, and refused to be moved onto the pie plate. I felt defeated. I tossed back several handfuls of the perfectly-ripe berries I'd picked up earlier at the market before I remembered that dessert needn't be so complicated. I set the crust aside and thought of the desserts of my childhood: Breyer's vanilla bean ice cream with Dad, and strawberries dipped in sugar with Mom. Both have remained favorites throughout all of my life, both are not complicated, but the exact opposite of complicated. And that's what I like about them. I piled the berries into a bowl and coated them in a thin layer of sugar. You don't need much. Stirring occasionally, I watched the berries soften and their juices start to form a puddle in the bottom of the bowl. I pulled out the ice cream and scooped a small dollop into my serving bowl, then drizzled the berries and their juices on top to serve. A couple of years ago, not too long after G and I first met, I learned to cook. We were poor college students, and after exhausting all of the entertainment options that the tiny town in North Carolina, where we spent our first summer together, had to offer, we turned to the kitchen. It started innocently: G suggested we take turns cooking each night. He'd been gifted a new set of cookware from his parents when he moved away for graduate school that he was eager to use. Our culinary strategy was simple, and one that required little skill or knowledge outside of knowing what we liked: throw any assortment of vegetables into a pan or a pot, add some seasoning, and cook. We kept this up for a few days; the two of us standing over the stove, evaluating whether or not we should add an extra tablespoon of red chili flakes to reach the level of heat we desired. Or in the case of G's first attempt at making homemade chili with the fresh tomatoes and peppers we picked up at the market, whether or not he should mix in a whole bag of oyster crackers (spoiler: he went for it; huge mistake). As projects I'm excited about tend to go, I approached learning to cook with equal parts excitement and ambition, that quickly turned into borderline obsession. And then almost without meaning to, I completely took over. Sometime after I'd started cooking nearly every night, I got on a veggie burger kick. Red beans with chickpeas; black beans with tiny chopped peppers; quinoa with oats and cheese. I fell in love with coming up with new combinations as the seasons changed. Over that summer, we must have eaten every single combination of beans and grains and vegetables, mixed together, grilled, and stacked between two buns. Until this spring, it's been years since I've made veggie burgers, though over the last few months, I've been making this slaw and these patties – separately, together, always in bulk. I always forget that spring doesn't come until late April in New York, yet by February I'm already craving greens and herbs and lighter lunches. Thus began my search for the perfect surge of greens, yet still something warm, comforting and filling enough to get me through the last of the cold days. The slaw on its own is tangy and nutty, but not too sweet, and the burgers are hearty enough to enjoy sans-bun, which is how I've mostly been eating them. Recipe inspired by Green Kitchen Stories' patties and Faring Well's slaw. 1. In a heavy bottomed skillet, sauté onion and garlic in coconut oil until soft and translucent in color. 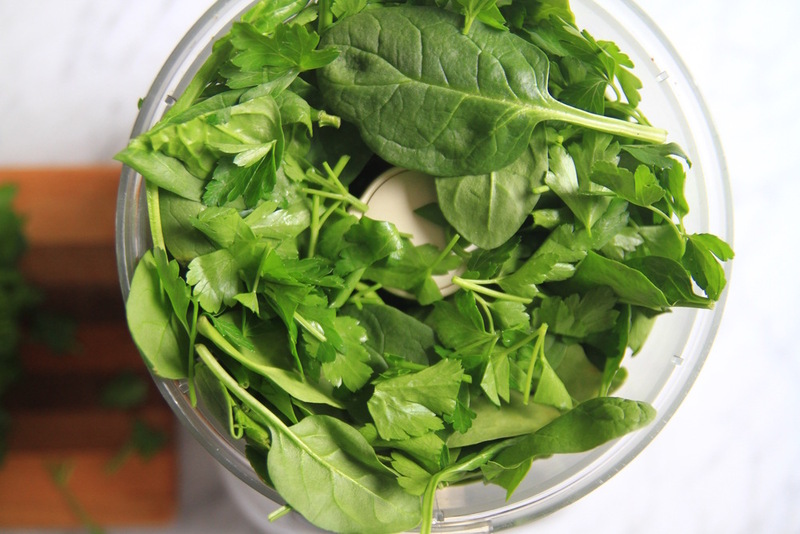 While it cooks, finely shop the spinach and parsley. 2. 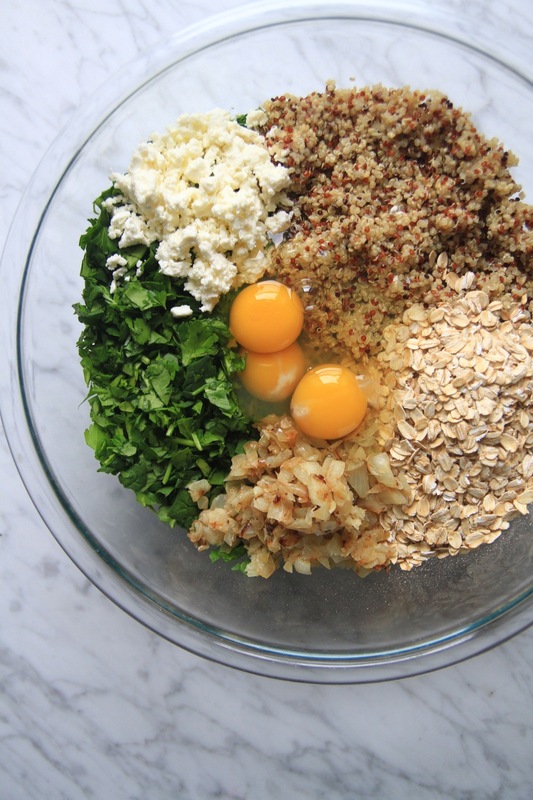 Add quinoa, oats, spinach, parsley, feta, onion, garlic, eggs, salt, pepper to a large mixing bowl. Use your hands to combine completely. Set aside in the fridge for 20 minutes. 3. Meanwhile, prepare the slaw. 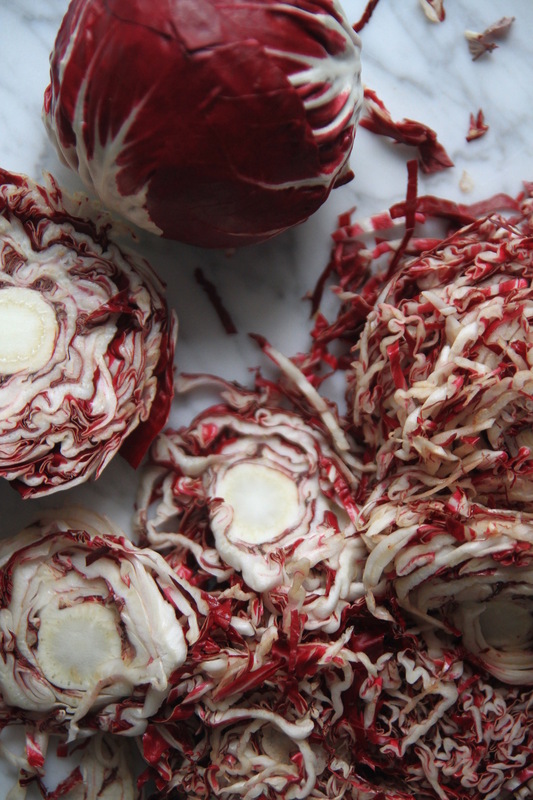 Using a mandolin, finely slide radicchio and place in a large mixing bowl. Combine tahini, lemon, mustard, apple cider vinegar, garlic, salt and pepper in a small jar and shake until emulsified. 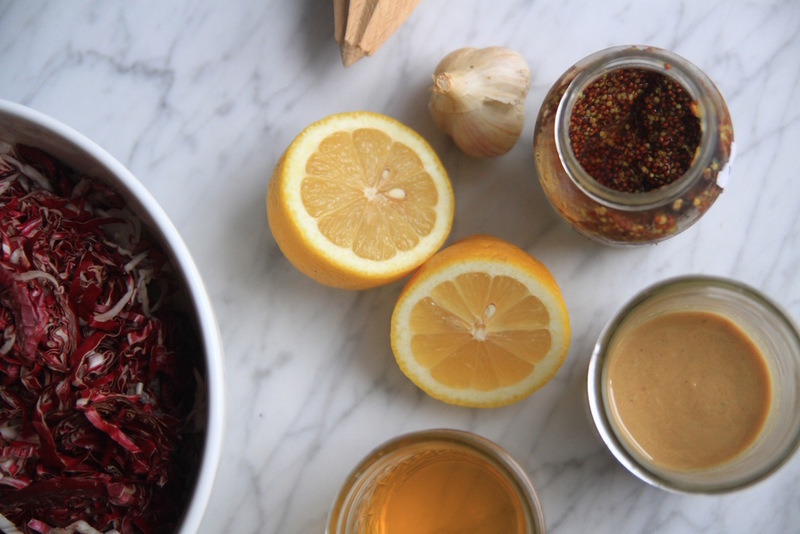 Pour the vinaigrette over the radicchio and mix until combined. 4. Once the burger mixture has set, form 10 small patties with your hands. Heat the coconut oil in a heavy bottomed skillet. Add each patty to the skillet, flatten them a bit, and fry on both sides for 2-4 minutes each, or until crispy. 5. To serve, place each patty on a toasted burger bun and top with a hearty pile of slaw. Add a smear of mustard, if you like.